Hey, maybe not a bug, but definitely a game crash issue. I was playing on Erebor, in the mountain as dwarves with dwarves as my allies to the south and the other two camps as allied mordor. All hard. I had Gloin doing his trap power at a key area and had literally hundreds of orcs trapped. Lagging ensued as well as the sound fx for that ability looping though I was able to continue play. Then the game crashed. I had graphics set on highest... was this the issue? Also, I think Heavy armor needs to help dwarves against trolls more. It seems that there are no dwarven units that effectively counter trolls. I expected Sigin-udrîg to be effective, but even fully upgraded and double-battallioned they were easily creamed - it seems that with the knockback the Sigin-udrîg just never had time to really damage the trolls. When I tried using fully upgraded Rakhâs-abzâg, also double battalioned, I was shocked to see that it only took one punch, despite formation and armor, to kill the entire battalion. it took at least two fully upgraded double battallions in block formation to bring down one troll even when they begain firing as soon as possible. It seems that the only dwarven units that could slow down 0 level trolls was both battallions Khazâd-uzbadul. But even then, despite a full range of upgrades, they were hardpressed, requiring constant attention and frequent healing. The dwarves need something that can take on trolls. Perhaps just give Sigin-udrîg unknockability when they are in tight formation and have been upgraded with heavy armor. That way at least they could do some damage to a troll before getting killed. MOst of the ones I sent never had time to attack before getting killed. As mentioned earlier... Rohan seems to have a pretty weak Ai when operating out of a camp... way too many battering rams. Also, veteran dwarven battalions seem to take forever [aka almost never] to replenish lost men... is this an error or was it intentional? Aragorn mounted has no horse footstep audio when moving around. The Arrows from the Call Volley power are pink. Utúlie'n Aurë! Aiya Eldalië Ar Atanatarni, Utúlie'n Aurë! Not sure if it's intentional or not. The camps citadels are invisible, I was playing on Adorn. I couldn't reproduce this. Which faction? Is it always invisible when playing on Adorn? Does it only happen on Adorn? Adorn only has castles, not camps, so are you meaning the castle citadel? I think I may have found a rather exploitable glitch for Rohan, I was playing on the river Glanduin map. I had bought ride light and swift, draft, Muster of Rohan, and Oath of Cirion. But I was able to buy Haldir and Galadrim without buying the aid from Lothlorien power. Just to say that I also was able to purchase haldir and the galadrhim without the aid from lothlorien, on a different map. I've been unable to reproduce this. Does it always happen or is it just a certain (few) maps? Do they only become available once you've purchased a certain amount of the other powers? Or ranked the archery range to a certain level? 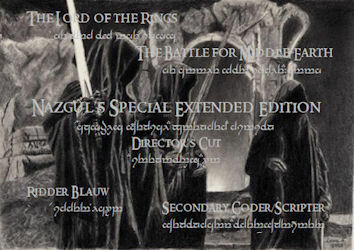 Also, the nazgul portraits on the purchase menu are at a wrong angle. I believe that's just the angle from the image that was chosen of them. I think it's the one from where the nazgul is sniffing out the hobbits from under that tree. Possibly. That number of units being trapped would be hard work for the game to deal with. - I don't think the spearmen are especially designed to take out trolls, they're more of an anti-cavalry unit. - Putting dwarven archers in formation increases their range, but reduces their armour, which would be why your battalions were wiped out in a single blow. Also, the archers have damage bonuses against monsters, and fully upgraded should be able to take out rank 1 trolls pretty quickly. - There's probably a degree of micro-managing that is needed when dealing with trolls/ents anyway. You should be using your archers to deal with trolls from a safe distance, and using infantry/spearmen to hold them up if they get too close. - The axe throw ability from the khazad guard usually takes out trolls pretty quickly. As does some hero abilities (eg. Gimli's axe throw/leap/slayer, Thorin's mighty blow). - The new azaghar gundu unit (from the guardhouse) should also be somewhat useful in dealing with monsters, if you can back them up with your other units. - Timing the use of your Dale summon is also useful in dealing with trolls. - Is it possible Mordor had some leadership going on at the time? Darkness, drummer trolls, Tainted Land, the Dark Tower, Nazgul, the Witch King.. All of these could be giving bonuses to your trolls if they were active/nearby. How much is 'huge'? I'd would expect a troll to level up to at least rank 2 after killing a double battalion of dwarf archers. Again, any experience leadership that might have been around at the time? Not something i've noticed. As far as i know, all units in game replenish units at the same rate. They won't replenish if they're moving, under attack, or fighting though. Keeping a well nearby is the best way to deal with replacing your dwarves anyway. Also, this isn't a bug really but I haven't seen carnen on the map selection screen. Probably just a bug in the mapcache somewhere. Again, pink issues are a most likely an installation issue, so if you haven't already, try uninstalling, uninstalling v0.5, and reinstalling. If that still doesn't work, details like Nertea mentioned would be great. Edited by _Haldir_, 27 March 2012 - 01:02 AM. I re-checked, and it seems that I wrote wrong. It was the outposts. Isengard dunlendings are using uruks ambient audio, ie snorts, howls, growls. Also have uruks audio while under fear or getting bombarded by siege. Moved Rad's post re:trolls to Balance. Continue the discussion there! I got home and confirmed a bunch of bugs, which I placed on the first post. They're also all fixed. I am unable to reproduce any of the pink arrow bugs on any of my test systems, so I have to assume that it's a conflicting mod/installation issue, unless you guys give me more data. I really don't do requests and my Arnor Soldier is not fit for BFME. Don't ask me for either. Could the pink arrows/pink loading screen issue possibly be a damaged upload/download issue? Since I tested the .55 version under the same circumstances without any pink issues. Uninstall all versions of TDH, and only install 0.75 you shouldn't have any pink arrows. It fixed my install. Edit: Still Pink Arrows/Pink loading screen, not sure what other info may be helpful to provide. Edited by Souske22, 28 March 2012 - 06:17 AM. Are you downloading through Desura? Desura seems to only give the .55 version even when I click the .75 version "Download On Desura" button instead of the large blue button on the Desura banner. Well I ran into pink arrows today on the galadrim warriors in marchwarden costume......trying another fresh install. EDIT: so I reinstalled over my previous 0.75 install - this time I right clicked the TDH installation Executable and selected run as administrator. I no longer have pik arrows on my galadrim. Edited by njm1983, 30 March 2012 - 04:01 AM. Marvelous idea Njm, fixed my pink issues as well. Wow, good find. I'll make it so any future releases ask for admin privileges to install - should prevent this. That should help alot, and also adding a reminder to run the launcher as an Admin might also help, I had a pink arrow issue pop up again and relaunched the game as Admin and it went away. Funny thing happend on the map Dunharrow(? ), I got Denethor and his four bodygards + one extra. I could not command him, he did not follow Denethor. If I selected him I got the command over Denethor instead. This guy moved after the enemy, chased some orcs, fight, and finaly meet his death. He did not revive, and Denethor remained unchanged. This is intentional - the actual bonus can't be seen until the Nazgul reaches level 5. Once it does, you'll see which bonus it is. It's mostly this way because randomizing at build has a few bugs with it - it was easier to randomize at a level. Again, the bugs related to fixing this are arguably worse than the bug. We'll look at Isengard at some point as well. Glad you like the mod. Do not force yourself into modding it's bad for your health. Didn't have that issue on the map I played with Isengard (on paths of the dead), perhaps it's map related. BTW, not sure if its a bug but are Nazgul supposed to revive for 0 resources? Seems kind of OP as you can beat a whole army with 2 nazguls and the witch king early game already. Check out my Special Power Guide on the 3rd Age, it learns some tips and tricks about making special powers for your heroes.